Shalimar, a Persian style garden complex, was built by the Mughal emperor Shah Jahan in Lahore, modern day Pakistan. Its construction started in 1641 CE (1051 AH) and was completed in the following year. The Gardens are located near Baghbanpura along the Grand Trunk Road some 5 kilometers northeast of the main Lahore city. There are five geographical sources of inspiration for Shalimar Gardens: Central Asia, Kashmir, West Punjab, Persia, and the Delhi Sultanate. 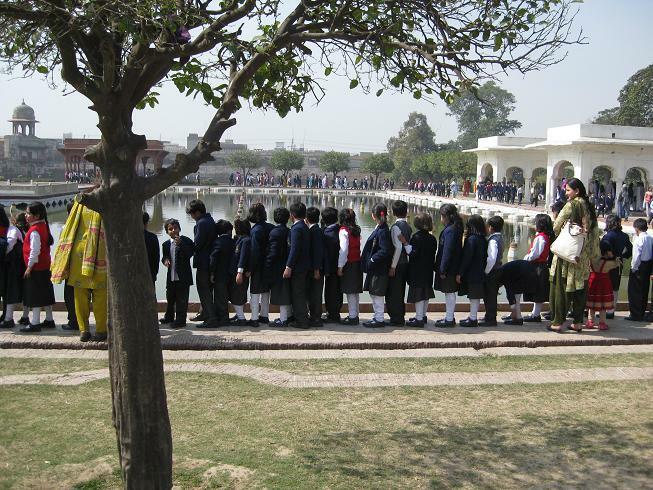 After marveling and wandering about in the spiritual world, I walked towards Shalimar Gardens nearly 300 meters way. Anyone going there would first encounter a high red sandstone wall interrupted by small decorative kiosks. This is a hallmark of Mughal architecture. Beside privacy and security, the walls excluded the wildness of nature and included the tended, watered greenery of the garden. The Shalimar Gardens were reportedly the best preserved Mughal garden having survived in the last 400 years. Others in Delhi and Kashmir with the same names were reported to be not in their original forms but much in ruins with some patches of paintings. Paying Rs.10 (about 12 cents), we entered the garden. The first glimpse was awesome; a line of fountains in a water channel stretched a long way. Unfortunately, there was no water in this part as repair work was going in full swing to greet the spring festival only a month away. The garden had three levels. We were on the first and the highest level. Presumably, in old days it was reserved for the imperial ladies as it was concealed from the view of people entering directly from the side doors on the lower levels. (Later, the doors were closed for good and one can entre only from the main gate). By a leisurely walk along trees and budding flowerbeds, we reached an arcaded pavilion which marked the end of the upper terrace. It was entirely built with white marble. Water was flowing under the pavilion, cascading down over a carved marble slab mimicking a waterfall effect. In the years gone by, this pavilion was used by Mughal Emperors and their family members to enjoy the coolness created by about 410 fountains. In building Shalimar, Shah Jahan sought to bring Kashmir down to the plains. Standing by the edge of the pavilion, one can see the middle and lower terraces. 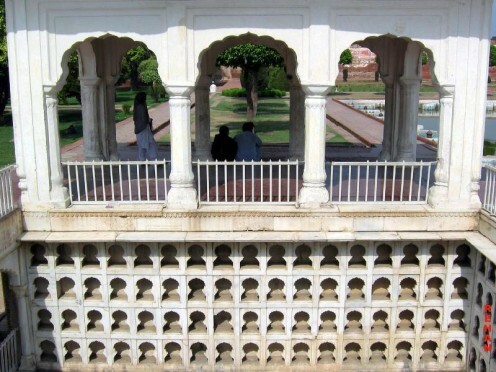 The gardens are surrounded by a wall with intricate fretwork or interlaced decorative designs in geometric patterns giving an overall view of an oblong parallelogram. In the middle terrace, there was a magnificent water reservoir studded with fountains. Though fountains were not working, the reservoir was filled to the brim. It was bordered by an elaborate marble work. 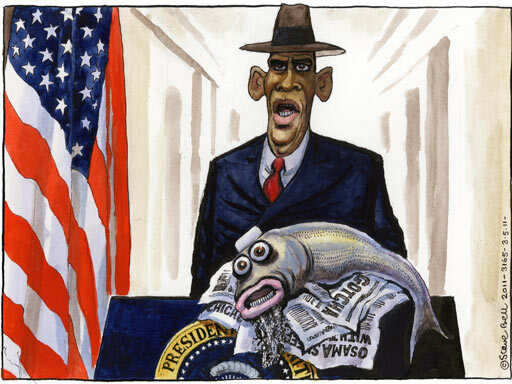 Alas, it was an off-season. I imagined the fountains playing, their water mixing in the air dampening faces of the visitors, a relief in the scorching sun. I further imagined the upcoming Shalimar Festival when the grounds would be artistically laid out with flower beds and promenades. All pavilions would glitter with lights and whole place would be transformed into fairyland. Shalimar Gardens of Lahore were one of the best specimens of the art of land-scaping introduced by the Mughals in the South Asian Sub-Continent. In 1981, Shalimar Gardens was included as a UNESCO World Heritage. The video above [courtesy the Tourism Dev. Corp. of Punjab, Lahore] is inluded here in this post to let our readers have an insight into the touristic gems of Lahore, Pakistan’s second largest city and its cultural capital. 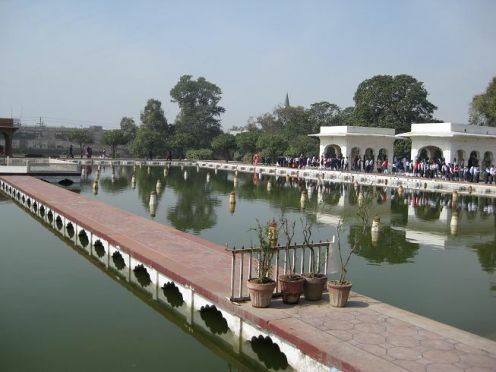 Shalimar Gardens being one of these principal attractions, form part of Lahore’s overall cultural and entralling ambience, popularly known as “Lhore Lhore Ai”. We enjoyed the panoramic views for quite some time and came down to the middle terrace to explore it further. There were lots of young school kids shouting “left and right” in unison. Their teachers were busy in keeping them together. We moved diagonally away from the kids to find a quiet corner. It was indeed rewarding. There was fragrance of flowers, the sweet chirping sounds of the birds and the sunlight sparkling in the water pools. It made the Mughal garden a complete sensual experience. Vide this Youtube video, you can have a stroll through the historic Shalimar Gardens of Lahore. Barring some background coversations which to some extent may obstruct your watching the video, this presentation enables you move through the gardens as if you are virtually there. A leisurely walk in the garden, along trees and budding flowerbeds, one reaches an arcaded pavilion which marks the end of the upper terrace. It was entirely built with white marble. Water was flowing under the pavilion, cascading down over a carved marble slab mimicking a waterfall effect. In the years gone by, this pavilion was used by Mughal Emperors and their family members to enjoy the coolness created by about 410 fountains. In building Shalimar, Shah Jahan sought to bring Kashmir down to the plains. The garden is well stocked with magnificent fruit trees and flowering shrubs. There are beautiful groves of lemon and pomegranate trees. Finally, we came down to lowest terrace which in old time had a public entrance. This was important because the ascending hierarchy of terraces symbolized the respective social levels within the court. After having a blissful time under the shade of green tree, majestic pavilions surrounded by rippling cascades, we came out of the garden to face glare and dust of the old city. 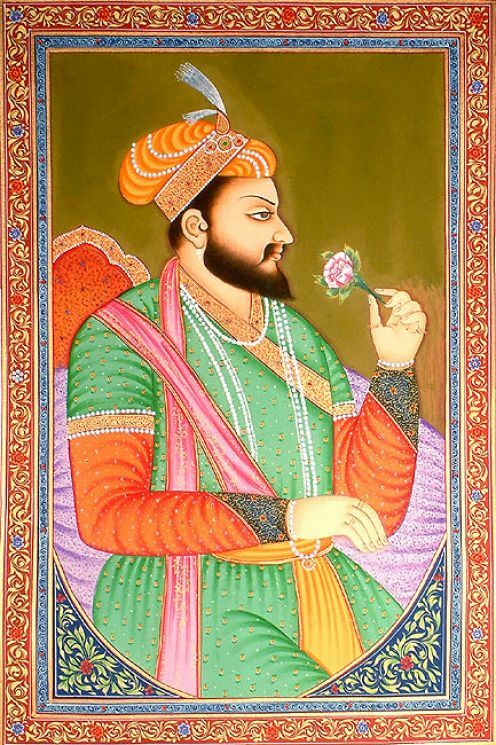 [Right]: Shah Jahan (Jan. 5, 1592 – Jan. 22, 1666). The name Shah Jahan comes from Persian which means “King of the World.” He was the fifth Mughal emperor after Babur, Humayun, Akbar, and Jahangir. While young, he was favourite of his legendary grandfather Akbar the Great. He is also called Shahjahan the Magnificent.He ruled from 1628 to 1658. Literally meaning, “King of the world, Shah Jahan ruled India for 30 years from 1628 to 1658. He was considered to be one of the greatest Mughals and his reign has been called the Golden Age of Mughals. Shah Jahan erected many splendid monuments: Taj Mahal, Moti Masjid, Delhi Red Fort and Mosque and Shalimar Gardens at Lahore and Delhi. His most significant contribution is building “Taj Mahal”, the most beautiful monument in the world. He built this monument for his beloved wife, Mumtaz Mahal. They were an inseparable couple, going together everywhere on royal inspections, military expeditions and constructions sites. 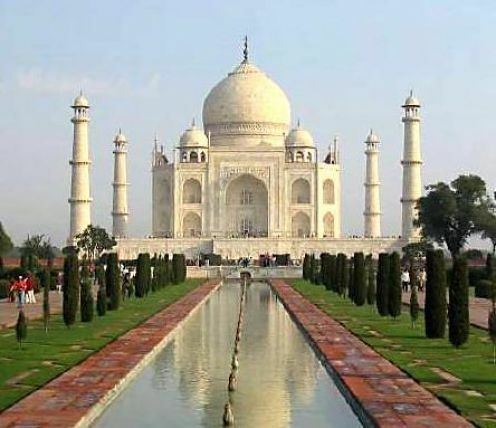 Right: Shah Jahan’s beloved wife, Mumtaz Mahal was the inspiration behind construction of one of the most beautiful symbols of love, the Taj Mahal. Born Arjumand Bano, in April 1593 in Agra, she was essentially Persian and a devout Muslim. Shah Jahan fell in love with her at the first sight and he was hell bent on marrying her. 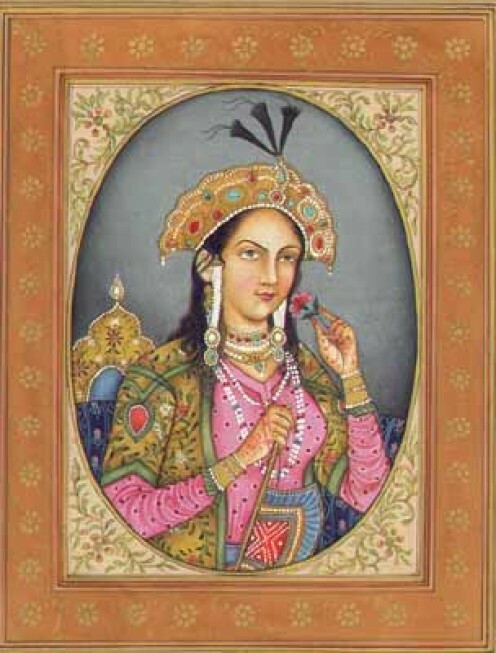 After capturing the throne, the king became the fifth Mughal emperor and immediately married her. During his 30-year reign, Shah Jahan had never expected that his last days would be so utterly tragic. In 1657, he fell ill and was dethroned by his son and imprisoned. When Shah Jahan was on his death-bed, he kept his eyes fixed on the Taj Mahal which was clearly visible from his place of confinement. After his death, Shah Jahan was buried there beside his dead queen, Mumtaz Mahal. The Taj Mahal, meaning “crown of buildings”, is one of the most recognisable structures in the world. Built by Mughal emperor Shah Jahan in memory of his wife, Mumtaz Mahal, it is widely considered as one of the most beautiful buildings in the world and stands as a symbol of eternal love. Taj Mahal is also the finest example of Mughal architecture, a style that combines elements from Persian, Turkish and the architectural styles of the day. Next PostWill India take over from Pakistan? SHALIMAR GARDEN OTHER MOGHUL ERA BUILDINGS ARE THE GREAT ASSETS OF PAKAISTAN, PLEASE SAFEGURD THEM AND BE SURE THAT THESE ASSETS WILL PROTECTED AND MAINTAINED BOTH BY THE PUBLIC AS WELL AS GOVERNMENT OF PAKISTAN. hello sir,I have created a page on face book by the name of Shalimar Garden Lahore, i am a teacher and Photography is my passion.I have shoot the shalimar Garden and i have more than five thousand pitchers which i am going to post on my page,I am really glad to read the information which you have displayed in the page.I really admire your effort,with best wishes, Maqsood Anwar Lahore.